High Value Coupon for Splenda Nectresse Natural No Calorie Sweetener at Target! Target is having a good deal for Splenda Nectresse Natural No Calorie Sweetener . 3.Final cost for this item $1.49! High Value Coupons for Glade Expressions Oil Diffuser Starter at Target! 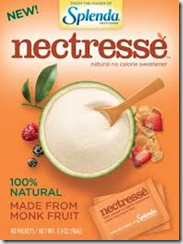 High Value Coupon for Splenda Nectresse Natural No Calorie Sweetener at Walmart!